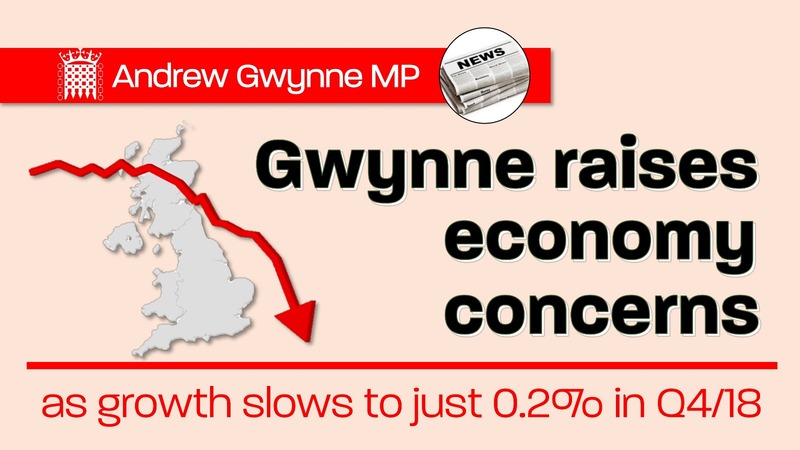 Denton and Reddish MP, Andrew Gwynne, has raised his concerns over the fragile nature of the UK’s economy as growth all but stalled in the last quarter of 2018 as new figures from the Office for National Statistics (ONS), confirmed growth was at its slowest rate since 2012. According to the ONS, quarterly growth for the last three months of 2018 slowed to a rate of 0.2% – down from 0.6% in the three months to September. The figures confirm a gross domestic product fall in December of 0.4% which includes a drop in the services sector, which is estimated to have fallen by 0.2% on the month – again this was the first since since 2012 where the services sector saw a fall. At the start of February the Bank of England forecast growth this year will be 1.2% – the slowest since 2009 when the economy was in recession. Added to this the ONS published figures showing the UK’s trade deficit, including goods and services, widened slightly in the last three months of the year by £900 million to £10.4 billion. The Bank of England put the fall in growth down to a decline in business investment and house building, as well as a halving of the growth rate in exports. “I’m deeply troubled by these new economic figures, they confirm that the UK’s economy more widely is grinding to a halt as investment stalls and businesses large and small demand certainty from the Government over trading relationships post-Brexit.